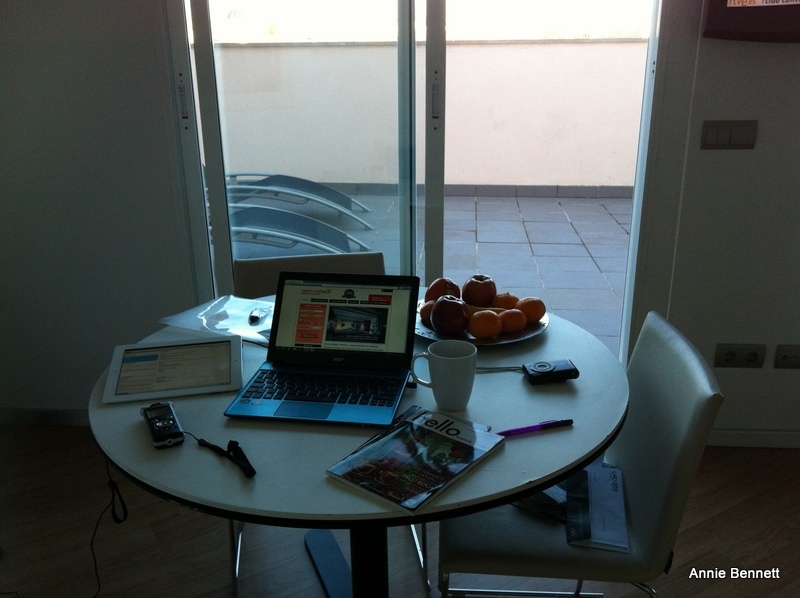 I stayed in a great apartment for a couple of nights in Valencia. 50flats is a building run by Valencia Flats, which has places to stay all over the city. In this case, the whole building is holiday apartments – in fact there are, um 50 flats – and it feels like a hotel, but with more space and freedom. The ground floor is a proper reception, staffed 24 hours, with computers, drinks’ machines and loads of information to help you make the most out of your stay. The receptionists were really welcoming and helpful too. I stayed in Ático 503, on the fifth floor. It has a good-size living room with a kitchen down one wall – pretty well-equipped and with a dishwasher. Décor is white and neutrals, unfussy, with parquet floors and contemporary artworks.The big shock was when the blinds went up to reveal a vast terrace – with loungers, table and chairs – with a panoramic view across the city. You could have a great party out there. 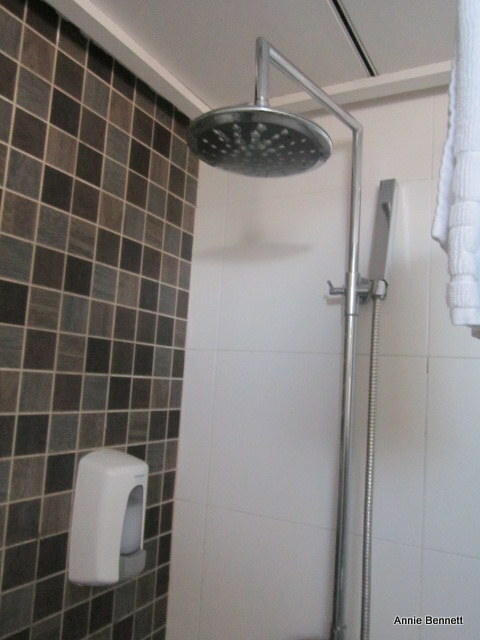 There is a separate bedroom, which also gives onto the terrace, and a decent bathroom with rose and handheld showerheads. Wifi is free with a good signal, but you have to sign in with separate usernames and passwords for each device. It is a really comfortable place to work undisturbed, and of course an unlimited suppy of coffee and biscuits helps things along tremendously. And it was quiet, with very little street noise. You can hear people talking in the corridor, and doors opening and closing, but it’s not too intrusive. Upstairs on the sixth floor, there’s an even bigger terrace for everyone to use, where people from the different apartments get chatting. There’s also a very handy laundry room – well, cupboard – with a washing machine and dryer, which was an absolute godsend to me. The 50flats building is on Calle Espinosa, which is about 10 minutes’ walk from the Norte train station, the central market and the shopping centre. It’s by Angel Guimera metro station and on a few bus routes too – although I ended up walking everywhere. All in all, I was really surprised by how smart and well-maintained it all was, as rates start from around €50 a night. 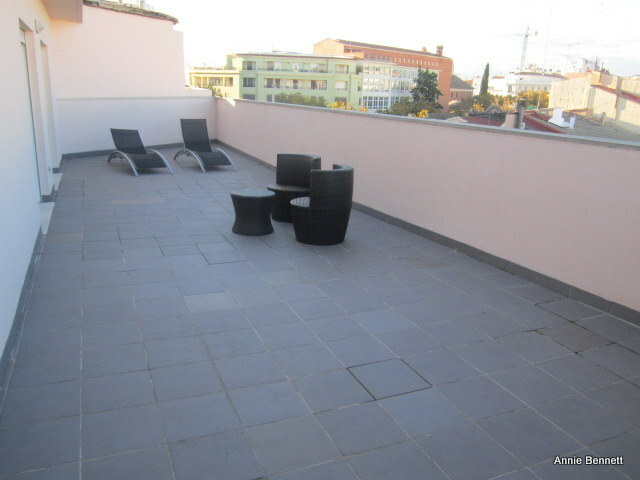 The áticos – or penthouses – cost from about €70. I’d particularly recommend 50flats if you haven’t stayed in a holiday apartment before. It’s a really professional, well-run set-up and you get all the back-up service you need. 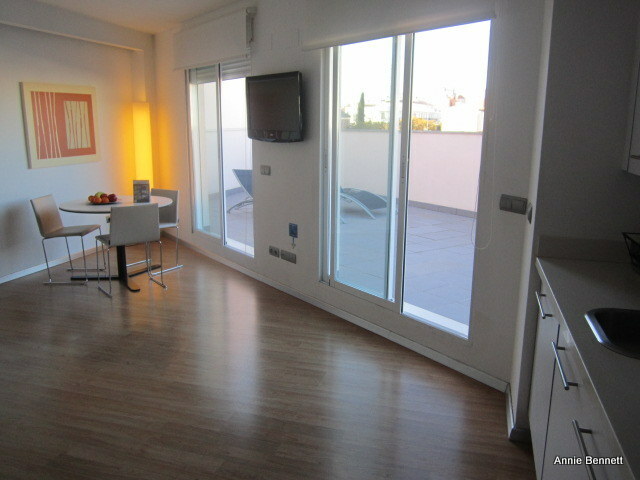 Today I’ve been there, in a normal flat, lovely and super good value for money! Thanks for the info. Great to know you also had a good experience there. Thanks!